Sera leads a simple life. A little smuggling, some drinking contests, and captaining her star freighter, Sabrina. But when she picks up a mysterious shipping container on Coburn Station, things begin to go wrong. She finds herself at odds with The Mark, a dangerous pirate organization that wants the cargo on her ship. Inside the container she not only finds a woman, but a secret thought lost millennia ago. The woman is Tanis Richards, and she knows the location of the Intrepid, a missing colony ship from humanity's golden age. Sera knows how to help Tanis and the Intrepid. But to do that, she will need to reveal a secret that will pull her back into a life she left long ago. A life from which she was exiled in shame and disgrace. Tanis doesn't trust Sera; and Sabrina's rag-tag crew is nothing like what she's used to, but she's going to have to rely on them to avoid capture and get back to the Intrepid. 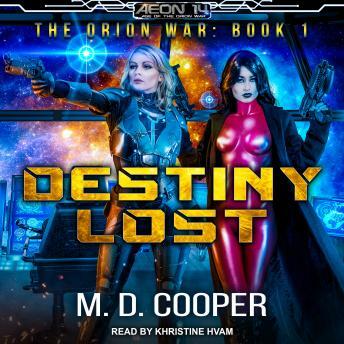 As Tanis and Sera battle pirates and interstellar governments, the two women forge a friendship that will forever shape the destiny of humanity.